Preheat oven to 350 degrees Fahrenheit. grease (3) 8-inch cake pans and line the bottoms with parchment paper. Set aside. In a large bowl, stir together the flour, cocoa powder, espresso powder, baking powder, baking soda, and salt until combined. Set aside. In the bowl of an electric stand mixer fitted with the paddle attachment, cream together the butter and sugar at medium low speed until smooth and fluffy, about 2 minutes, pausing once to scrape down the sides of the bowl. Add the eggs, one at a time, mixing well after each addition. Add half of the buttermilk, then half of the flour mixture, and mix at low speed until nearly combined. Then add the remaining buttermilk and flour mixture and mix until a smooth batter forms. Evenly distribute the batter between the three cake pans. Place in the oven and bake until the cake pulls away from the sides of the cake pan and a toothpick inserted into the center of the cake comes out relatively clean, about 45 minutes. Remove from the oven and allow to cool for 15 minutes before inverting the pan onto a wire rack, removing the cake from the pan, and allowing the cake to cool completely. 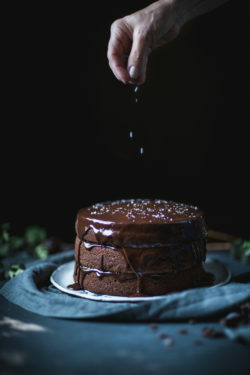 Once completely cooled, if needed, use a bread knife to cut the dome off of two of the cake layers so that they are flat at the top, rather than dome-shaped. (Enjoy this dome bit for pre-cake slice snacking). In a small thick-bottomed saucepan, melt together the butter and chocolate until smooth, stirring constantly. 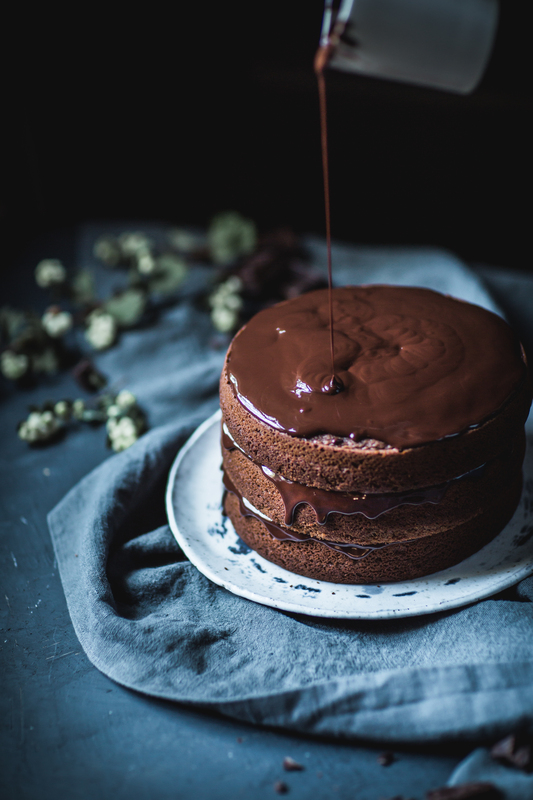 To assemble the cake, place one layer of the cake on the serving plate and drizzle 1/3 of the chocolate sauce over it. Place the second cake layer on top and repeat the drizzling. Place the third and final cake layer on top and repeat the drizzling once more. Sprinkle with the desired amount of flake sea salt and serve.